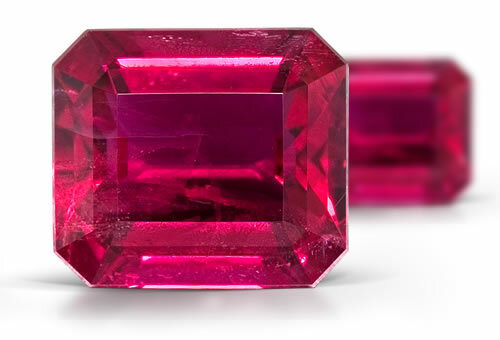 Red beryl, or bixbite, more closely resembles emerald than any of the other beryl varieties, exhibiting its typical internal characteristics of inclusions and fractures. Its rich color is due to the presence of manganese. This gem is recognized as one of the rarest gems on the planet, and has only been found in the Wah Wah Mountains of Utah, USA. refractive index, birefringence and strenght of color. Magnification is the key test for separating natural from synthetic beryl. Gemstones are rare and tend to be small. Typically kept in mineral form. Manganese is the coloring element. Greater color saturation than Morganite. Bixbite is often confused with Pezzottaite. Bixbite is a type III stone and clean stones are very rare. Bixbite frequently contains fingerprints and other liquid filled inclusions, 2 and 3-phase inclusions, hollow or liquid filled parallel tubes. Tiny grains or crystals that can be quartz crystals, adularia and hematite are typical inclusion. Hexagonal growth zoning is often seen.